One just loves to travel by train – despite the fact that getting a ticket is not easy; many a times it is not clean…. … it could run late – yet ~ the largest employer in India – Indian Railways continues to fascinate. It transports millions across the Nation and has come a long way since 1853 when the first train ran from Bombay to Thane. Railways has been keeping pace with the modern developments including modernization of rolling stock, signalling, stations and terminals; safety and more. The most perceptible one is the way people buy tickets for travel. You need to go back in history to appreciate this. Earlier days there was no connectivity and each station had its quota ~ booking a return ticket was so cumbersome. Then in 1980s came the computerization – a great facility, you could stand in that big ticket booking complex in Central [later in 6 places in city] ~ ‘any counter – any place – any class of ticket’ was a great hit – though one had to stand for hours in serpentine queues. It functioned from 8 am to 8 pm, if I remember aright. The most often asked Q in those days to any travellers [by concerned parents and others] was ‘have you taken the ticket with you ?’ – some would forget and rush back to take the ticket and travel………… those days of physical tickets…. 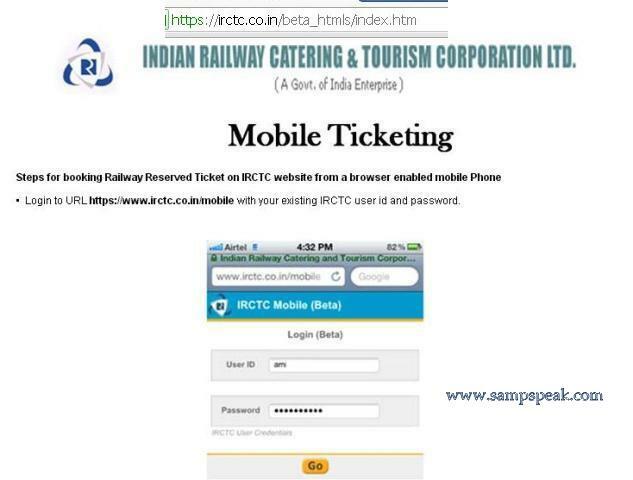 E-ticketing through IRCTC website, www.irctc.co.in, revolutionized the way the common man deals with the railways and has been the biggest success story of e-governance in India. Travelling public were relived that they can have multiple printouts and need not worry too much of that missing ticket…… one can even take printout from an internet kiosk anywhere……….. later, Railways introduced the facility of travelling with just confirmation of booking in one’s mobile [SMS / image of ticket would do !!!] ~ great innovation indeed. • Have a credit card/cash card. In case you are wondering what USSD is : Unstructured Supplementary Service Data (USSD) is a protocol used by GSM cellular telephones to communicate with the service provider's computers. USSD can be used for WAP browsing, prepaid callback service, mobile-money services, location-based content services, menu-based information services, and as part of configuring the phone on the network. USSD messages are up to 182 alphanumeric characters in length. Unlike Short Message Service (SMS) messages, USSD messages create a real-time connection during a USSD session. The connection remains open, allowing a two-way exchange of a sequence of data. This makes USSD more responsive than services that use SMS. Typically, the user composes a message on the phone keyboard. The phone sends it to the phone company network, where it is received by a computer dedicated to USSD. The answer from this computer is sent back to the phone. The answer could be seen on the phone screen, but it is usually with a very basic presentation. The messages sent over USSD are not defined by any standardization body, so each network operator can implement whatever it finds suitable for its customers. Now here is how it is going to work for you : The one introduced by IRCTC is a non-internet based ticketing system. One can use their mobile phones to book tickets in a simple, convenient and secured manner. It uses simple SMS or menu-based USSD technology which works on all mobile phones and involves no internet and costs very little. • Register for Airtel money by dialing USSD (Unstructured Supplementary Services Data) number *400#. • Enter mPIN for authorizing payment through Airtel money. • Booking confirmation SMS is sent by IRCTC and same can be used during journey along with valid ID proof..
• Fare & service charges are debited from your Airtel money account. • Bank provides MMID (Mobile Money Identifier) & OTP (One Time Password) through IMPS (Immediate Payment Service) option. • Generate OTP through your Bank for authorization of payment. • Make payment through sending an SMS, in the following syntax, to 139 PAY <Transaction ID as received><IMPS><Your MMID as received from the bank><OTP, your one time password as received from the bank for this transaction><IRCTCUserID> and your ticket is booked; confirmation SMS is received on your mobile and same can be used during journey along with valid ID proof. • PG charges Rs 5/- for ticket amount < Rs 5000/ and Rs 10/- for ticket amount >= Rs 5000/- (as applicable by bank). • 2. "Send <mobileno>,<mmid>,<amount>, <transaction Id>,<OTP>" to your Bank IMPS number. • Agent Service Charges: As applicable. • This is a menu driven application where user has to enter the details asked for in simple step-by-step process to get the ticket. PS : largely reproduced from www.irctc.co.in.